Mark Boyle was one of the speakers at the Uncivilization Festival where frank opinions were exchanged in bucolic surroundings. 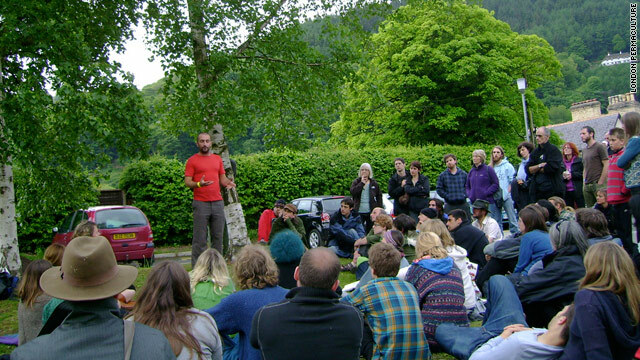 Event organizer Paul Kingsnorth doesn't think he and other are "giving up"
Llangollen, Wales (CNN) -- There was a dark cloud over the sleepy Welsh town of Llangollen last month -- literally and metaphorically -- as a group of around 400 environmentalists camped out under swirling curtains of summer drizzle to debate the collapse of industrial society. They were gathered for the first Uncivilzation Festival and loosely united under the banner of "The Dark Mountain Project", a British environmental group. Most were veteran campaigners, many with decades of experience in lobbying, marching and agitating for various ecological causes -- but now it seems they have lost faith. "We have to face facts," co-organizer of the festival Paul Kingsnorth told CNN. "Mainstream environmentalism has failed over the last 40 years to have any real effect. It will not be able to stop the damage we are doing to the natural world over the timescale in which we have to act." The Dark Mountain Project aims to unite people around the idea that mainstream environmentalism has lost touch with the natural world. It believes that the environmental movement has been co-opted by consumer capitalism and is obsessed with "greener" ways to maintain our standard of living. "People talk in terms of us having 100 months to stop the worst effects of climate change, and we're just not going to do it," says Kingsnorth. "If we had 100 years, maybe. "You can't on the one hand accept the science on climate change, and on the other expect to solve it all in eight years. It's not going to happen. Just look at the momentum of development around the world. "Dark Mountain is where you come when you finally admit that to yourself." Billed as a gathering for people who have "stopped believing the stories our civilization tells itself", the Uncivilization Festival featured folk music, a free shop, where festival-goers could take and donate whatever they liked, art installations, a cinema, workshops, and lots of debate late into the night about what to do next. Freeconomy advocate Mark Boyle described his experiment in living without money. Other speakers included Vinay Gupta, who advises governments, including the USA, on how to deal with disasters, and spiritual and environmental thinker Alastair McIntosh. "The idea of Dark Mountain has been in development for a long time," says Kingsnorth. "It was a reaction to what we increasingly saw as a false, over-optimistic, world view. "In many ways it was a hard place to get to: when you have campaigned on green issues your whole adult life you are very tied-up with the idea that you can change things." Kingsnorth, the author of books including "Real England", a polemic about the corporate takeover of English life -- which UK Prime Minister, David Cameron, quoted extensively from in a speech on localization -- felt that as a writer he wasn't addressing the issues in the right way any more. "I began to think: 'what happens when you really start to believe the science?'" he says. "When you really start to accept how serious the situation is?" As such, The Dark Mountain Project originally began as a group of writers and artists, but it has broadened as the ideas it discussed struck a chord amongst disillusioned British greens. Already it has drawn fire from the "mainstream" ecological movement -- with Britain's most famous environmental journalist, George Monbiot, criticizing The Dark Mountain Project for disengaging with campaigning. In fact, one of the most charged moments at the festival was a debate between Monbiot and festival co-organizer Dougald Hinde. Despite expecting a hostile reaction -- Monbiot joked about being the first sacrifice to the "cannibal Dark Mountain survivalist cult" -- both men garnered applause, as an open-minded audience tried to grapple with the complexity of the position that they found themselves in. "George [Monbiot] builds a powerful case [for the power of campaigning] but I'm not sure he even believes what he says," says Kingsnorth. "It's not going to stop the momentum... It's just not good enough to say we need to 'build movements' when it's clear that's just not working. "We're in a position where we're effectively campaigning against our own standard of living, and that's just not going to happen. "It's a painful thing to say, but the big stuff can't be stopped now." Despite this bleak position, Kingsnorth is adamant that those gathered at the Uncivilization festival are not just "giving up" as critics argue. "Of course we're not saying stop campaigning despite what George [Monbiot] says," says Kingsnorth. "We're saying: 'be realistic; based on what we know, what can we do? "We still need to decarbonise the economy -- but we need to know why we're doing that. Yes, let's build windfarms, but we need to know why. "We can't consume our way out of this, however 'green' that consumption is. We have to realize we can't maintain our western lifestyles." Kingsnorth doesn't predict the imminent collapse of capitalism and some kind of Mad Max future -- at least not yet. "We will see a stumbling decline in our capacity, based on the impact of climate change, extinction, loss of biodiversity and habitat destruction -- and we do need to prepare ourselves for that. "Dark Mountain is just a stage on the journey to working out how we deal with that future. "I've no idea where it goes next."